The power supply is switchable from 120V to 240V with the flick of a switch, allowing the ES900 to work with different voltages throughout the world. Your clock's programming is protected with a user-selected four-digit numeric password. For your additional safety and peace of mind, these clocks are UL-approved and carry an industry leading two-year limited warranty. Offers a selectable hour format (12 or 24) and choice of standard minutes, tenths or hundredths and even seconds, or consecutive numbering (up to eight digits with up to nine repeats). Thirteen optional preset messages (RCVD, SENT, IN, OUT, CFMD, FILED, PAID, USED, FAXED, VOID, ORIGIN, APR’D, CMPL’D) in your choice of English, Spanish, German, French, Italian or Portuguese. 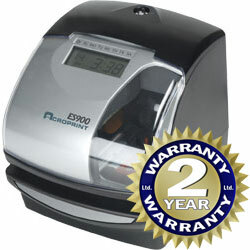 For payroll or time and attendance applications, I-Mark, the optional "irregular" mark, identifies early and late punches to speed up time card calculations and improve payroll accuracy. You can even adjust the print font size to accommodate your needs.